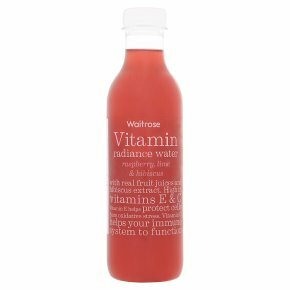 A pasteurised blend of water, raspberry and lime juices, with hibiscus extract and added vitamins. With real fruit juices and hibiscus extract. High in vitamins E and C. Vitamin E helps protect cells from oxidative stress. Vitamin C helps your immune system to function. INGREDIENTS: Water, raspberry juice (12%), agave syrup, lime juice, hibiscus extract, Vitamin C, Vitamin E.